We featured this tip once previously, but as it is a Windows trick we use almost every day, we are going to feature it again. If you’re not using this “middle-click trick”, you’re missing out on a great time saver. If you have a mouse with a middle button or a scroll wheel, then you have a middle-click option you may not have known about. We’re going to show you a middle-click trick you will use often.. When Notepad is open you’ll see its icon in the taskbar. Now middle-click the Notepad icon – you’ll see that it opens a brand new instance of Notepad. You can do this again and again (don’t get crazy) and each time you middle-click on its taskbar icon a new instance of Notepad will open. 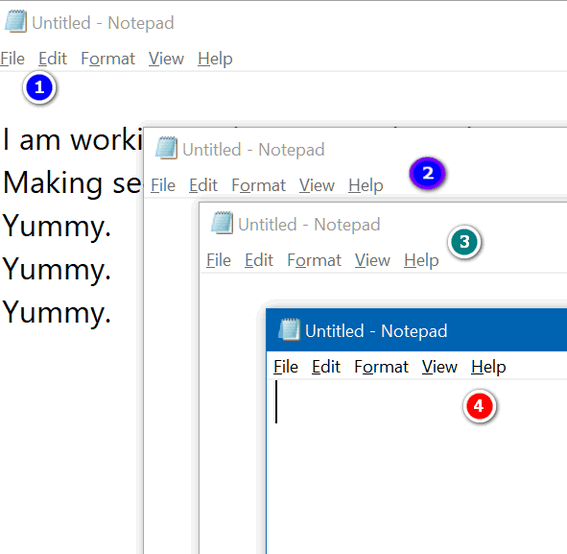 You can see that I have 4 Notepad windows open, I’m working in window #1. By middle-clicking the Notepad icon on my taskbar, I can open as many new Notepad windows as I want. Geeky people call this opening new instances. Take your choice. If you think your mouse wheel is not a middle click button, try pressing down on it quickly – like you would your left and right mouse buttons. Most of you will find that your mouse’s scroll wheel doubles as middle mouse button. The mouse I’m using right now is a cheap $15 Walmart wireless mouse – and the wheel doubles as a middle mouse button even on my cheap old mouse. If you need to run more than one instance of a program, try the middle-click trick right now. It will save you time. I must have missed that feature. I love it already.